Accompanying photos were taken at Compton (Los Angeles) during ceremonies and the unveiling of a bronze tablet marking the nearby site of the early U.S. air meet on Dominguez Hill fifty years ago. 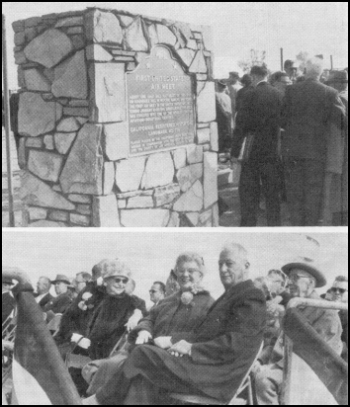 Shown in the top photo is the bronze tablet,and at extreme right is EB Charles F. Willard with his arm around EB Roy Knabenshue. Lower photo shows in the foreground (left to right) Mrs. Charles Willard, Mrs. Roy Knabenshue and Charles Willard. An attractive bronze tablet set in stone was unveiled at Compton (Los Angeles), California on January 24, 1960, marking the site of the first United States air meet atop Dominguez Hill, known as Dominguez Field. That meet brought together some of aviation's greatest pioneers. The big event fifty years ago ran from January 10 to 20, 1910, and on opening day over 20,000 spectators watched as records were broken by such air heroes as Glenn Curtiss, Lewis M. Paulhan, C. D. Hamilton, Charles Willard, Lincoln Beachey, and Roy Knabenshue. The records they set were not only accomplishents in themselves, but they were stimulants for the air developments of the future. On had for the dedication services were two of those 1910 particiipants-- Early Birds Charles Willard and Roy Knabenshue. Two other Early Birds on hand were Harvey Crawford and George Eddie Barnhart whose planes were at the 1912 meet, two years after the original. Likewise, the dedication was attended by a host of people who had been spectators at that air meet in 1910. They well recalled the flights of Willard, the first Curtiss student, and the dirigible exhititions by Roy Knabenshue. The latter was flown to the ceremonies by helicopter. "About one-half mile southeast of this spot, on Dominguez Hill in historic Rancho San Pedro, the first air meet in the United States was held during January 10-20, 1910. Subsequently this area has evolved into one of the world's leading aviation industrial centers." Included in the dedication program were Mayor Delwin M. Clawson of Compton as master of ceremonies; Roy Knabenshue, pioneer airman, as special honored guest; and others. Col. C. S. Smith, publisher of the Herald-American Newspapers, gave the history of the 1910 air meet. The fiftieth anniversary of that Air Meet was also marked by a nostalgic dinner at Cal-Tech's Faculty Club and services at the Portal of the Folded Wings on January 10th, with Early Birds participating.